From Peanuts hoodies to a high-fashion laundry bag, these are the best collaborations, fetish objects, and hyped-up releases of the season. Who better to front the current wave of sporty Americana in the fashion universe than Charlie Brown—a style icon in his own right. This season the logos on Todd Snyder's long-running Champion collab have been taken over by Brown, Snoopy, and the rest of the “Peanuts” crew. We're not saying that Linus, Lucy, and Pigpen are the next street-style stars, but we're not not saying it, either. Sneakers are fashion now, and Givenchy's new pièce de résistance—the brand's first since artistic director Clare Waight Keller took over—is big, aggressive, and toothy (hence the name). Mary-Kate and Ashley Olsen's quiet luxury label launched a men's line this fall. It also made shades with Oliver Peoples. Fashion and nightlife have long been partners in crime—but Coach took things a step further and combined the two for this collab with famed Hollywood hot spot (once co-owned by Johnny Depp) The Viper Room. Ever since the iconic Ralph Lauren Polo Bear was introduced in 1991, the stylish little guy has turned every sweater, needlepoint slipper, and bedding set he's appeared on into a collector's item. 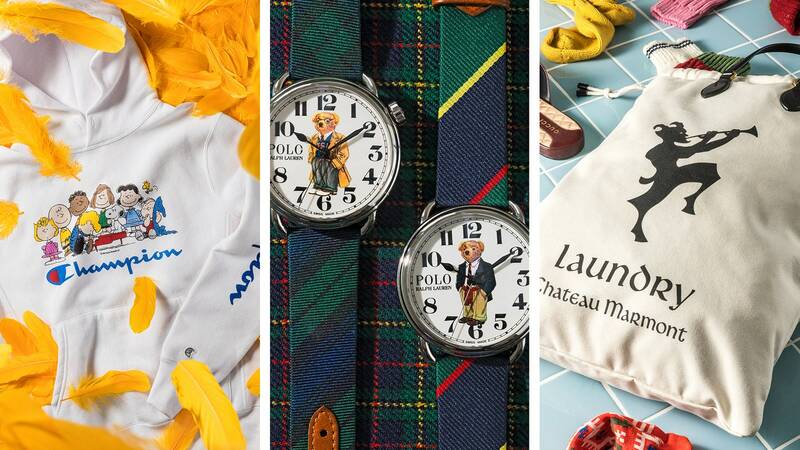 For the 50th anniversary of his brand, Ralph's introducing the most covetable Polo Bears yet: these watches, which feature four of the nattiest characters in Polo history (including Spectator Bear and Preppy Bear, here) atop a Swiss-made mechanical movement. And since Ralph's first product was a tie, there are plenty of silky-strap options to choose from. Finding vintage Jordan gear that hasn't been chewed up by a dog or desecrated by mustard drips is damn near impossible. Thankfully, Union has re-created that soft, washed-out feel for the Jumpman. This totally new run of reedy camo gear will help you blend in with hard-core outdoorsmen and streetwear fiends alike. The N.Y.C.-based skate-prep label finally landed a coveted Vans collab—and revived a rare classic from the archives. The winning shoe trend of the fashion season was the return of thick-soled, pointy-toed creepers—and no one did it better on the runway than Michael Kors. To keep you stylish on the slopes, L.A. streetwear savant John Elliott linked up with Japanese heritage ski brand Descente on a pair of super-clean down jackets. The Sunset Boulevard hotel famous for housing celebrities in search of stylish solace now has a line of merch featuring its mascot, Pan, god of the wild (also the horn-blowing creature found on cocktail stirrers at the hotel bar). Gucci creative chief Alessandro Michele has already used such notable American iconography as the Yankees logo and Donald Duck in his designs, but this marks his first time working with a Hollywood landmark. The laundry bag (or souped-up tote) is a clever homage to hospitality, but the capsule also includes a tee and a sweatshirt.